Meet EHX's new fully-analogue timekeeper. 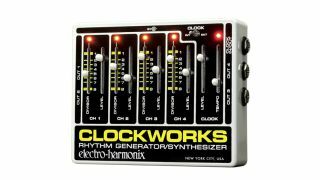 Apparently, the original version of Electro-Harmonix's 1978 Clockworks rhythm generator/synth has been going for upwards of £790 on certain online auction sites. So, in order to meet the obvious demand, EHX Founder and President Mike Matthews tasked his engineers with creating a new version. Arriving in die-cast package, the new pedal is designed to be used as a master clock for sequencers and drum machines and to trigger electronic percussion products. It doesn't generate any sound of its own, but sends pulses that fire other devices. Clockworks is available now priced at $294. You can find out more on the Electro-Harmonix website.